After a largely consistent run through the season, Fabian Coulthard’s championship tilt came apart in spectacular fashion with a rollover at Pukekohe. The Kiwi had appeared to be a beneficiary of a hairpin melee caused by Chaz Mostert, who after hitting David Reynolds during a passing attempt, slowed to redress. Coulthard blazed through but hadn’t quite cleared Reynolds before the Shell Ford returned to the racing line for the Turn 10/11 left handers. The right-rear of the Ford tripped over the left-front of the Holden, sending both sliding into the tyres, which flipped Coulthard onto his lid. It wasn’t the hardest hit of the season but, for many, it was the most memorable clash of 2017. Having taken the 11th place he needed for the title two corners earlier, McLaughlin slid wide at Turn 1 on the penultimate lap of the Newcastle season finale. It was just enough to allow Craig Lowndes, who had pitted for fresh tyres under a late yellow, to draw alongside and, when McLaughlin went to block, contact ensued. Squeezed by the Ford, Lowndes’ Holden struck an access opening in the concrete wall, breaking its steering and cutting its front brake line – which sent the veteran spinning backwards into the tyre wall at the end of the straight. A time penalty to McLaughlin cost the youngster his maiden title, while Lowndes’ second DNF of the weekend dropped him from sixth to 10th in the standings, his worst result since 2004. Nick Percat suffered every driver’s worst nightmare at Albert Park – a front-brake failure while at maximum speed on the front straight. The 2011 Bathurst winner spun his Brad Jones Holden to the inside of the circuit in an attempt to wash off speed, before cannoning into a hapless Lee Holdsworth as he swept back across the circuit. Although both drivers walked away, their cars suffered heavy damage and, missing the remainder of the weekend, required extensive rebuilds before making the boat trip to Symmons Plains. All cars received a minor upgrade for Tasmania as a result of the incident, with control brake supplier AP Racing adding a second seal to the drilling ports in the front calipers as a safe guard against any repeat issue. 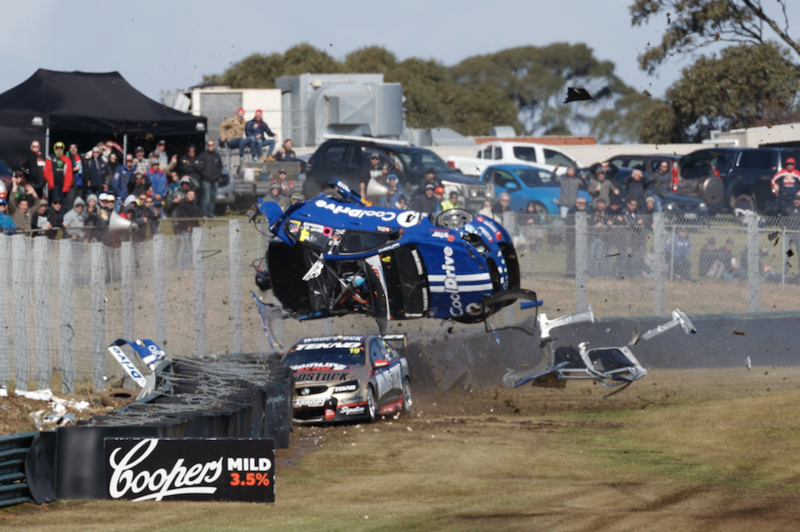 In any other year, Todd Hazelwood’s wild ride at Sandown would have gone down as the biggest shunt of the season. The 22-year-old’s PIRTEK Enduro Cup debut ended in spectacular circumstances on the penultimate lap of the co-driver qualifying race, when he was punted off by Jonathon Webb at the end of the back straight. Hazelwood’s Holden hit the tyre wall side-on and flipped wildly through the air. With the car destroyed, Brad Jones Racing was forced to hurriedly build up a new chassis for Bathurst. Webb was fined $15,000 for causing the crash while, remarkably, Hazelwood was straight back behind the wheel for the afternoon’s Dunlop Super2 Series race. A third place finish aboard his Matt Stone Holden kept his Super2 title bid on track and, according to Hazelwood, was the perfect way to rebound from the first major accident of his career. The second lap of the Saturday race at a wet and slippery Symmons Plains delivered carnage of an unprecedented scale in the Supercars Championship. Side-to-side contact between Fabian Coulthard and Rick Kelly on the run through Turn 3 was the trigger – the sliding Ford knocking the Nissan into the left-side wall. 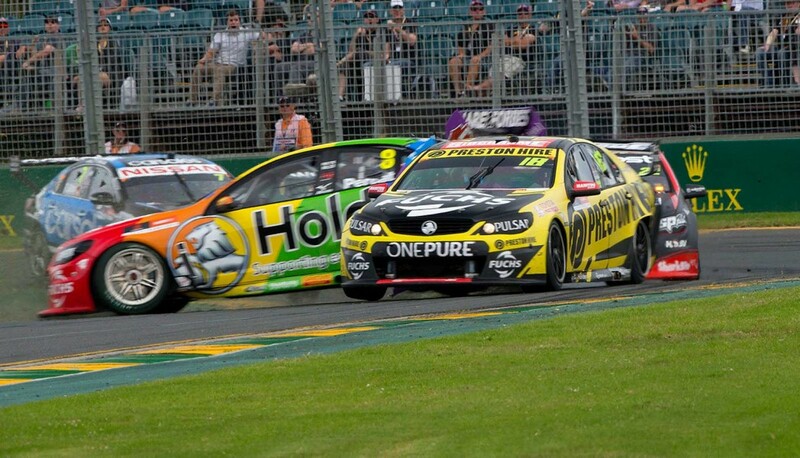 With both cars slowed by the contact, a chain reaction dragged in those behind - Tim Slade, Garth Tander, Cameron Waters, Percat, Tim Blanchard, James Moffat, Scott Pye, James Courtney, Alex Rullo, Will Davison, Taz Douglas and Simona De Silvestro. Davison fared worst of all, sustaining a fracture to an offshoot from a vertebrae, while Kelly – whose car was struck heavily by Davison’s Holden – was later diagnosed with two minor muscle tears in his left leg. Joining the duo on the sidelines for Sunday due to the damage to their cars were Courtney and Douglas, while others – including all three BJR entries and both GRM Holdens – required extensive overnight repairs. The lengthy clean-up meant no more racing laps were completed for Race 3. While restarting the cars and greeting the flag after the time cut-off under Safety Car satisfied the requirements for a race to be declared, no championship points were awarded.